I hope that this finds everyone of you happy, healthy, and with loved ones in this holiday season. This morning I realized that for the first time in 22 years, Todd and will be childless on Christmas Eve . . . . Tyler is working all day and Sara is working in the evening while Todd and I travel to Iowa without them. They will be joining us tomorrow tho – so all is well. 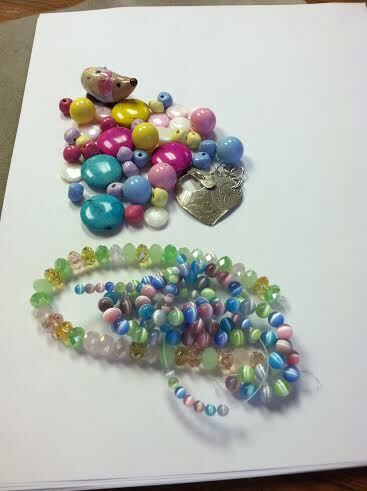 The important link first: 2014 Bead Soup Blog Hop. If you want to see some really cool beadie stuff – go there and click around. For those of you who aren’t “beaders” the gist behind Bead Soup is for people to exchange a bunch of beads/findings and making something with it. I believe Lori Anderson started it with the odds and ends that were left on her table after projects. Then started trading with friends and now it has grown to an international, fueled by facebook, annual event. This is my second time around. My partner this year is Mallory Hoffman of For the Love of Beads. 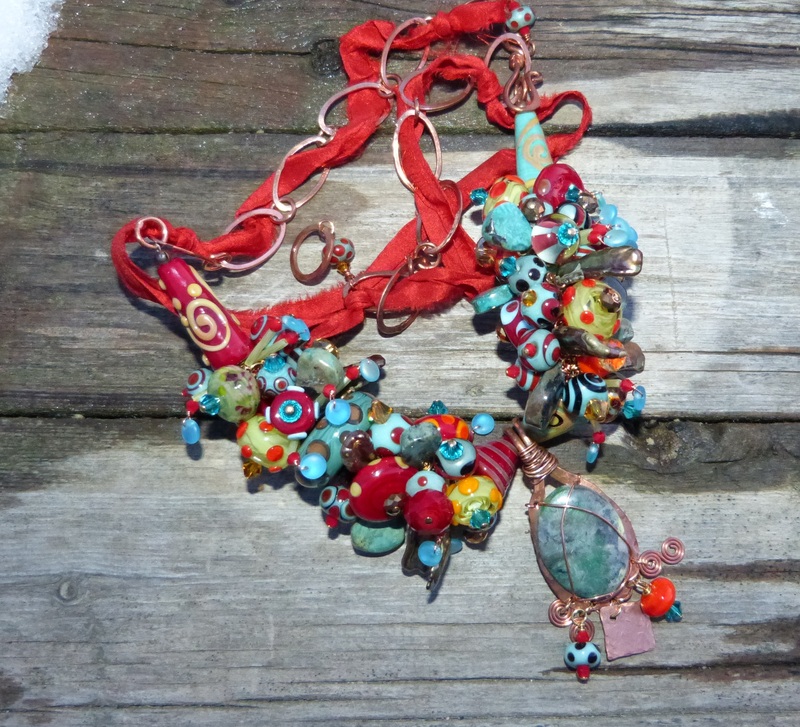 Please visit her blog and see what she did with some Twisted Chicken Beads! I knew we would connect when I saw her pink sparklie shoes! Yes . . . I signed up again . . . I love the idea of trading beads! LOVE the idea . . . but the details of getting the stuff on the computer drives me absolutely CRAZY. So, I think I have the badge on my side bar (only 30 minutes!). I have the beads photographed (yeah, well, we won’t talk about how long that took! ), and the box sealed up (yup, had to reopen the fancy packaging cause I forgot the clasp!). 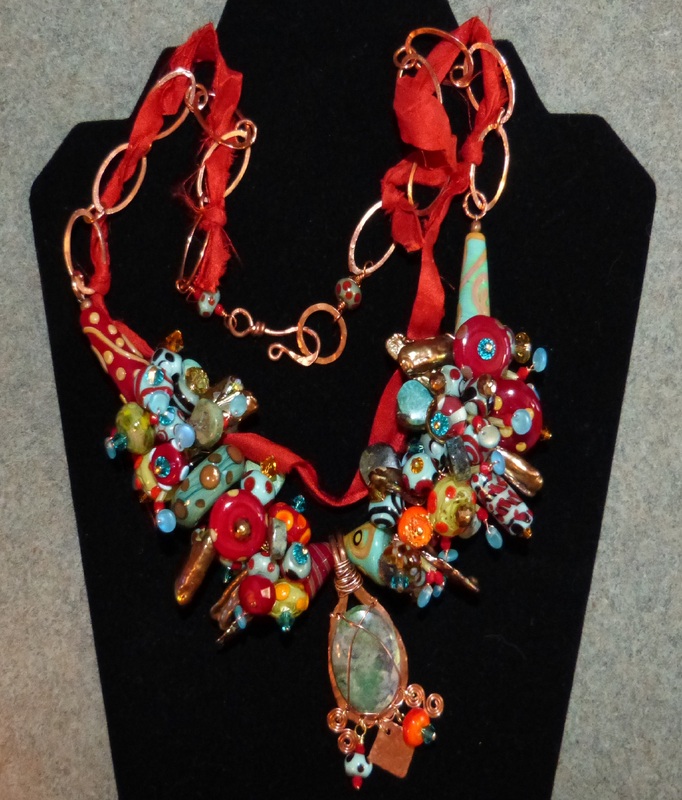 But I am thrilled to make a new friend — meet Mallory Hoffman of For the Love of Beads. Now for those of you who really know me, know that it was fate for her and I to be paired up! Just Friday I talked to Michelle at Mr. Vinnie’s (she’s been doing my hair for YEARS!) about bright red hair to cover up the gray. And did you see the pink shoes? LOVE them! From the pictures on her blog I can hardly wait to receive the soup mix she has sent me. And I really hope she likes what I’ve chosen for her. Here’s the picture, a little messed with, of what I sent her. Once she has received it I will put a real picture on here so you all can see it. Last Saturday, Annette and I traveled to Fort Madison to visit Linda Ross at The Artisan’s Next Door. We had a great time – old friends and new friends . . . and Chloe! The bead ladies (Merrell, Annette, and I) are not signing up for as many art shows this year. Last year didn’t go too well so I am focusing my energy on more online sales and getting into some galleries. Check out the twisted chicken square market (you know, when I get some stuff loaded . . . right now it’s just CSA)! It’s been a LONG, COLD winter and we are all looking forward to spring and a lovely summer. An update on the full-time job — still LOVE it! Its a great place to work. The only down side is that the patients there are so very sick, but everyone (staff and patients) are so very nice and care for each other. It’s very inspiring. 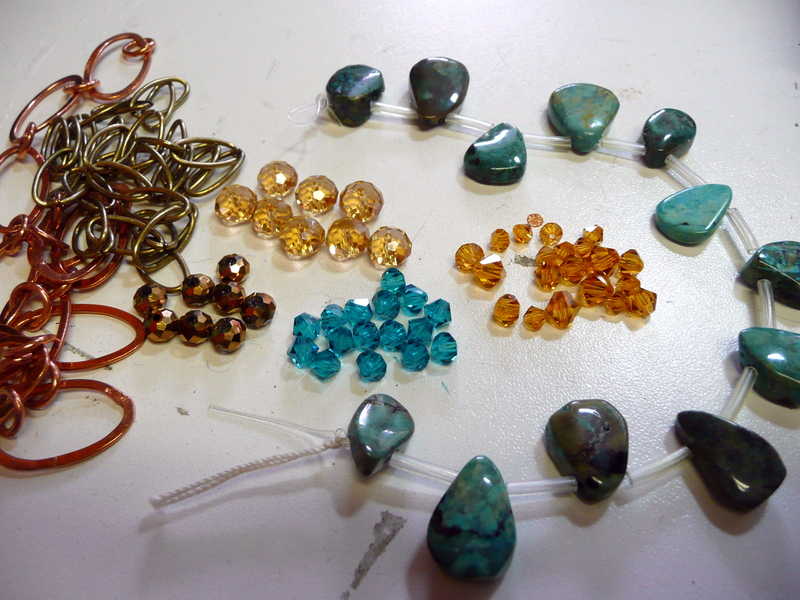 So — here’s to a year with more blogging and more glass beads! So, its been a busy year — not that I blogged, but busy none the less. I got a full-time job . . . in July! That didn’t bode too well for the garden . . . horribly, actually. After much soul searching, I cut the CSA season short. I just couldn’t keep up. It was painful — mostly for me, I think! Everyone else seemed to take it with some amount of grace. I also had booked a whole bunch of art shows . . . which also led to the shortening of the season. I would like to report that we did well . . . but we didn’t. Anywhere – but, Canton, IL. That first time show ROCKED! So that part of my life is also being re-evaluated. I did not order new chicks this year. It’s time to take a break from the twice a day going to the barn and worrying about the wild life and the weather and all that stuff. There are on going discussions about tearing the barn down and building my own workshop. But tonight that may have also been shelved. I did submit some photos to a book . 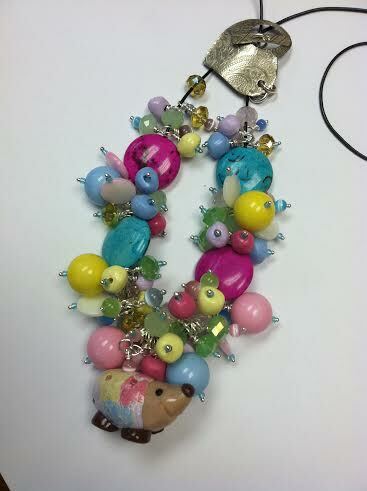 . . 1,000 beads – which will be out in April, 2014. Everyone I know will be very sick of seeing me carrying around my copy! I looked at Lampwork Etc (a forum that I belong to but rarely look at these days) and I can tell you that there are some really cool lampwork beads that are included in that book. I am humbled to be included. The family went to San Francisco for five days. That was an adventure . . . . I would love to go back again someday. I joined the electronic age — am typing on my brand new iPad Air with blue tooth keyboard. I would hope that I can now take some pictures and get them posted to the blog more often! 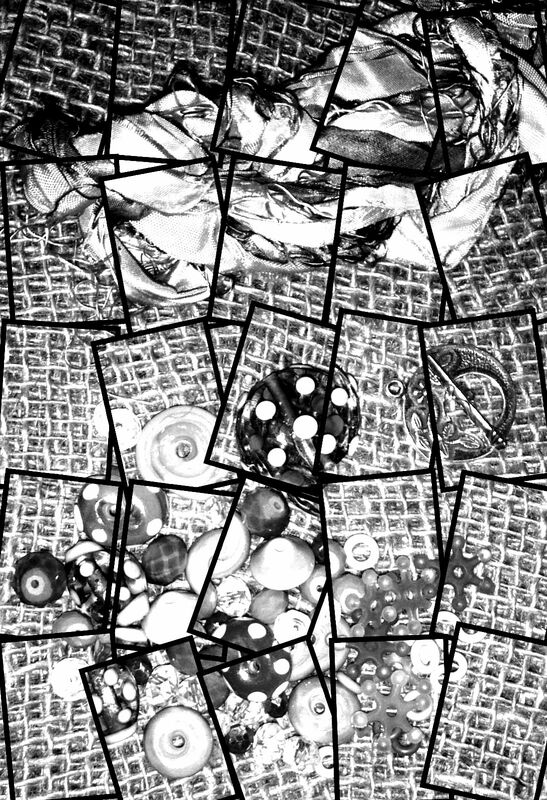 So, stay tuned to see what’s next in the adventures of Twisted Chicken Beads, Etc. I sent two sets cause I could! 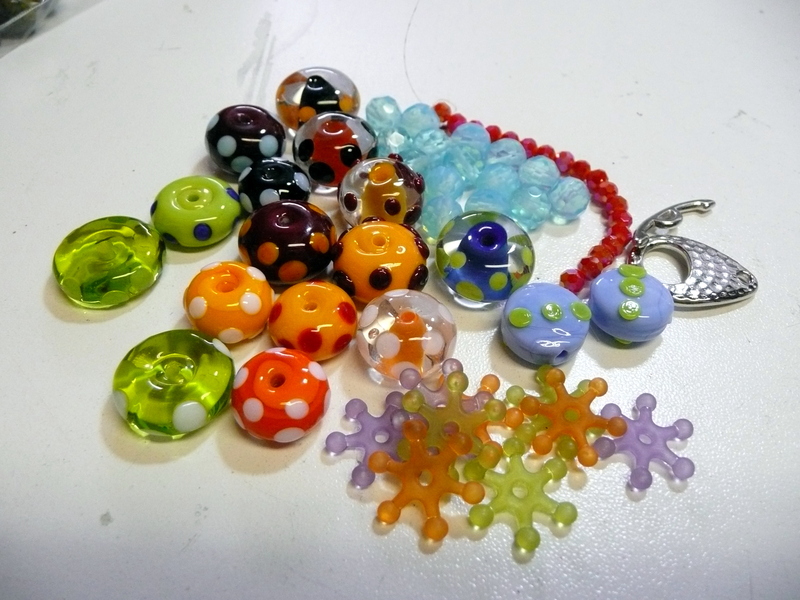 The bright color one is one of my favorite set of beads/colors to work with — lampwork, whimsey, and happiness! After looking at Dana’s website I decided to send a second set of earth tone beads that were left over (truly a soup rather than selected just for her). Visit her website here! 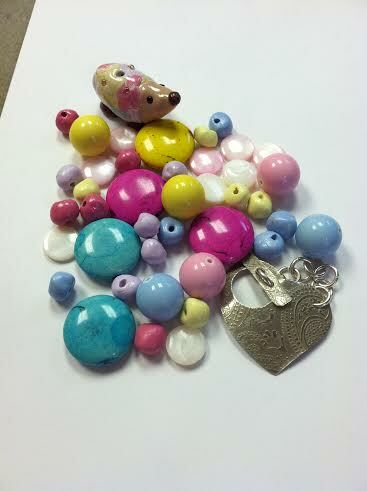 Be sure to visit her blog to see what she made with these beads! There were also some great silks — three colors! The finished design only included one of the silks but I have some new beads that are just begging to be put with those silks. Last night Todd helped me with the new camera and I may actually start posting pictures. Now for the confession: I have help with my design work and color choices from Merrell Hickey. She manages to include colors that I would have never put together but the finished product is ALWAYS fabulous and I love it. This one in particular is just grand. From earlier posts you know that We had major room changes over winter break. My “craft” room has been moved to the basement. 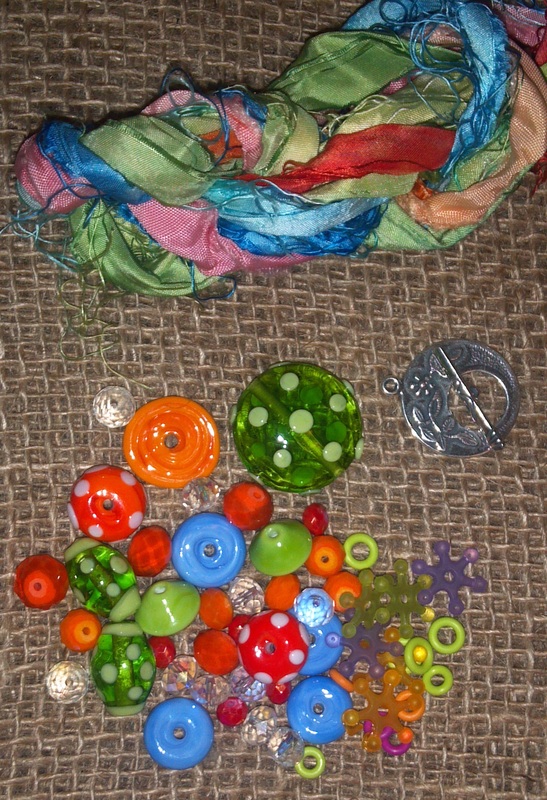 While the kids have their bed rooms put all back together my craft stuff is still kind of all over the house because I want to go through it before I put it in the “craft room.” So, as I have been going through things I have found unloved beads . . . and I had a stash to give to Merrell. In that were some lampwork beads that I made a really, really, really long time ago — petrolium green and red . . . well, in Merrell’s words, they “play well with these beads over here” and wow — did they ever. There are also some more current beads (like the half bicone on either side of the pendant and where the chain attaches to the strung piece). The up close photo shows Dana’s great pendant and we added some parts that were in the soup and some of my lampwork beads dangling off the bottom. My favorite photo was taken on a really old, outdoor picnic table (see the snow in the left hand corner?) just as the sun was going down. And I did manage to get some help from Houdini the one-eyed cat . 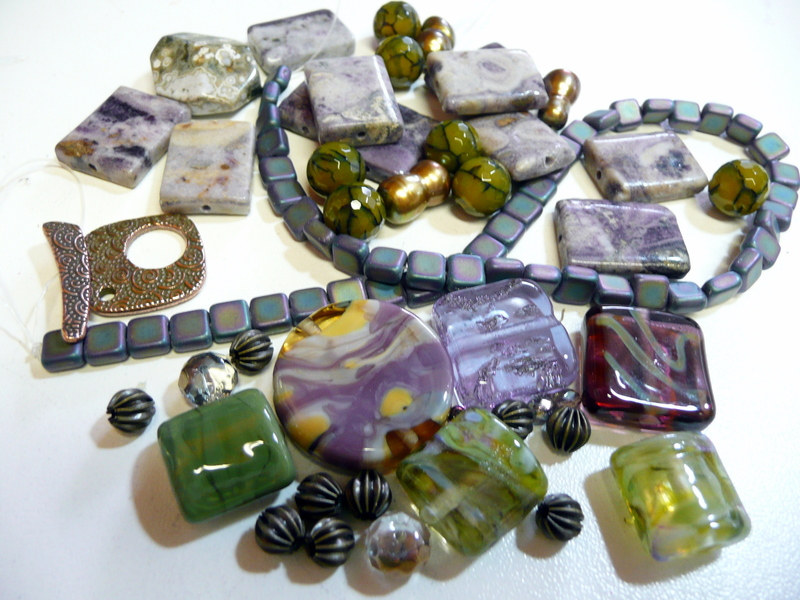 . .
And so ends my adventure with the Bead Soup Blog hop. I hope everyone enjoys the pictures and be sure to check out the others who are participating. You can find a list of all the blogs here! 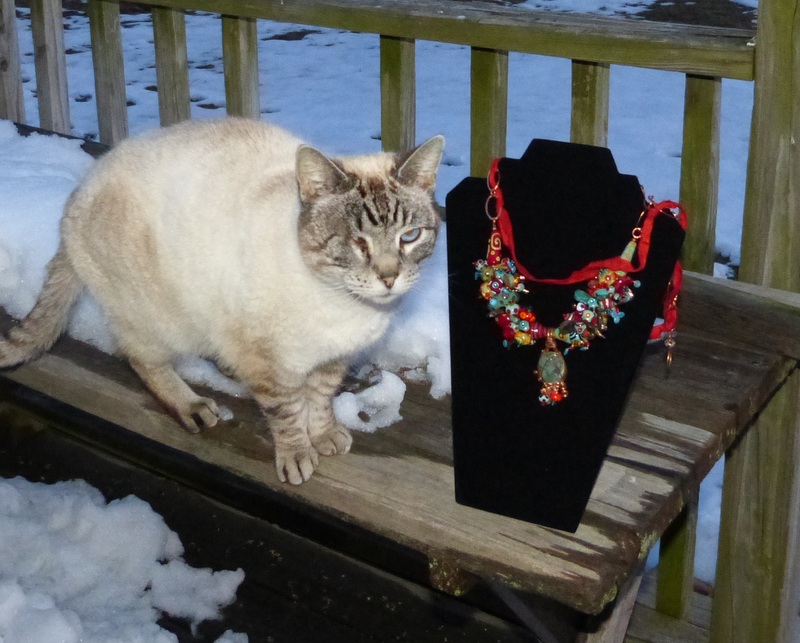 Though I’m pretty sure that no one has such a handsome helper as Houdini! and here is the link to Dana’s post. 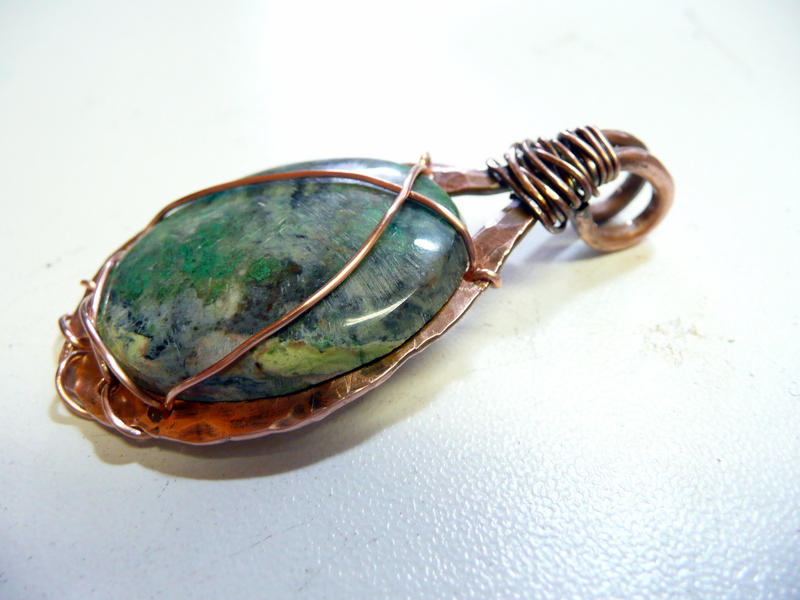 She did a great job on turning a lampwork bead into one of her cool pendants. And the bright colors pop on the bracelet! I got the news yesterday — I did not get into the Marion Fine Arts Festival this year . . . . I’m kinda bummed but am going to keep applying to some other art fairs . . . . trying to break out of my geographic region! The flip side is that I am going to participate in two Art Sprees with the Illinois Artisans Program in Chicago — one in July and one in September. I am very excited about that! The class in Galesburg on Saturday (sorry, no pictures . . . .) went so well that Annette and I are going to go back on March 9 to teach a leather wrap bracelet class. March 2 we will be in Fort Madison, IA, teaching the Viking knit to ladies there. Be sure to come by and see us, even if you can’t come for class — just say hi! In farming news — last week I managed not to burn down the barn! I came home (Wednesday, I think), came in the house (as always), checked the mail changed my clothes . . . went to the barn. Wondered what that odd smell was and figured that the neighbors were burning something. Turned out my heat lamp had fallen, probably about the time I pulled into the garage and straw trapped under the metal was starting the smolder! I haven’t had it plugged in since — I’m a little weirded out about how close that was . . . . I have managed to sprout two flats of 72 cells of lettuce (each a different kind) and planted one flat of 48 of peppers. . . . that one hasn’t sprouted yet. I’m thinking of bringing in a heat mat to give it a boost. But since the heat lamp incident, I really want to be home the whole day to keep an eye on it. Maybe Sunday . . .
Just a quick one – cause I still need to do six months of bookkeeping stuff . . . today! Like that is going to happen. So – I’m participating in the Pretty Things – Bead Soup Blog Party and yesterday, after many stops and starts put my package in the mail to my partner, Dana James (http://danasjewelrydesign.blogspot.com). I’m hoping she likes it. I can’t put any of the details here – just in case! You can find a list of all the participating blog hop people at: blog hop! One night I’m going to sit in front of the tv and blog surf . . . .
It’s cold and rainy here. Annette is coming over and we are going to complete the kits for our upcoming classes at Vintages Tasting Room, Galesburg, Saturday, February 16th and Artisans Next Door, Fort Madison, IA, Saturday, March 2. 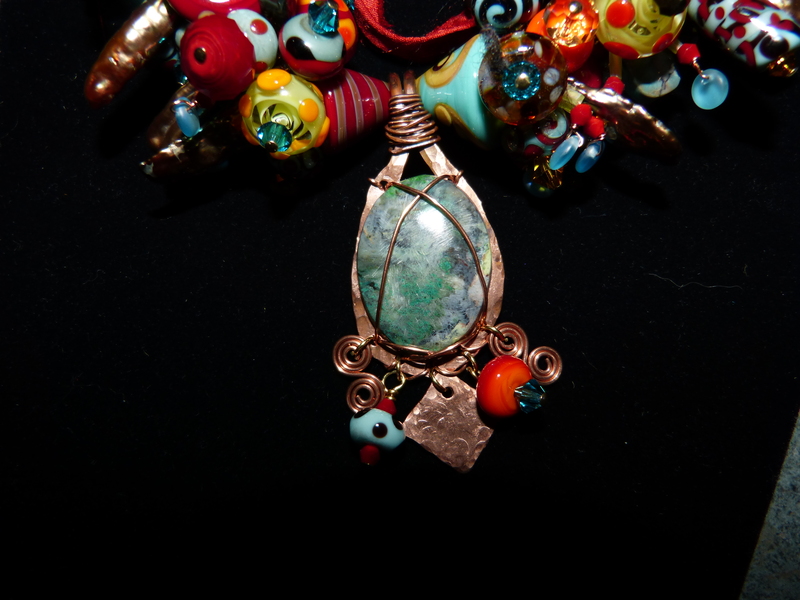 I have shipped a bunch of earrings and two samples to Linda Ross at the Artisans Next Door — stop by and check them out. 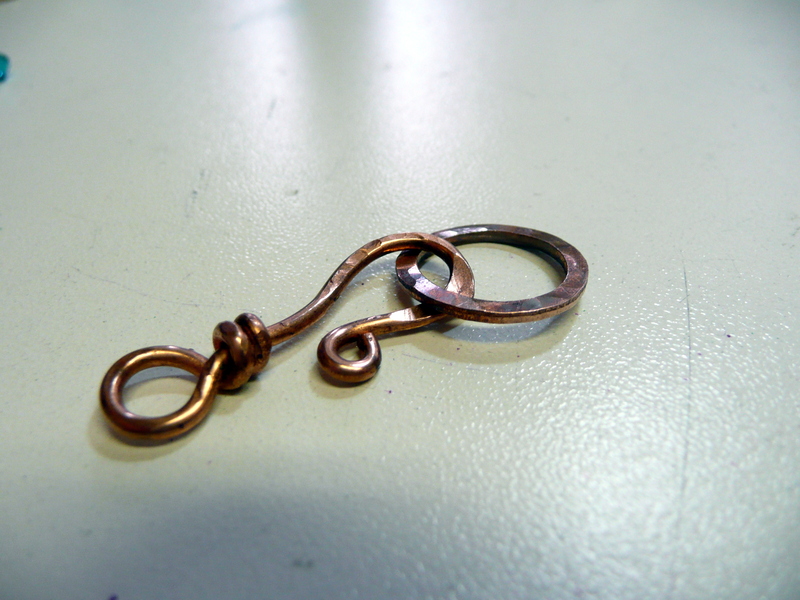 We will also have the box of make and take and finished jewelry for those who don’t want to do the longer class. Be sure to visit all your local shops!